This summer I have been working at an overnight canoe tripping camp on an island in Algonquin Park as a swim dock lifeguard so my parents picked me up from the island Friday night and the three of us spent the night in a hotel close to the race site. Saturday morning was race day. I woke up early to make it to the race site about an hour before race start in order have enough time to wait in the lines for package pickup, set up my transition, warm up, and put on my wetsuit on (which takes a solid 10 min). Somehow, time flew by and we ended up arriving 30 min before my race start. Leaving me running around getting things ready in time (this ended up being my warm up haha). 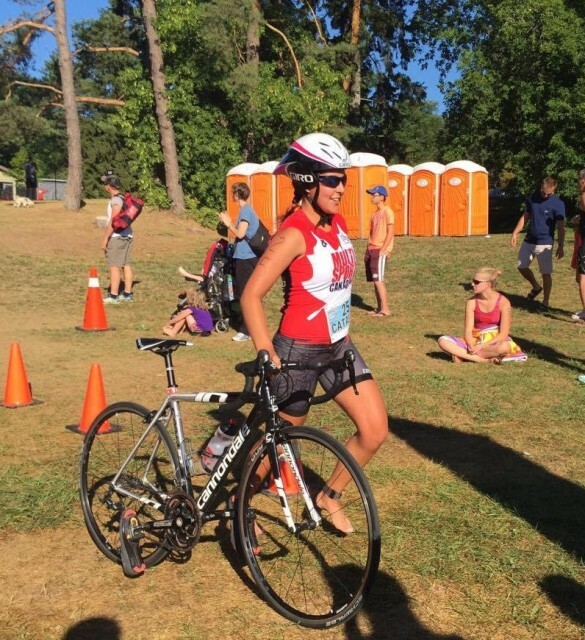 In transition, I chatted with my friend and fellow Multisport Canada Recharge with Milk Ambassador Team member, pro triathlete Angela Quick, who was volunteering at this race. She told me that the swim was wetsuit optional therefore I was not going to swim with a wet suit giving me more time to finish up getting ready. My parents walk up and interrupt me mid-sentence to say hi… I was like uh hello again fam. They pause and stare at me waiting for something.. Im puzzled until I look further to their right. My jaw just drops. My boyfriend is standing there grinning his face off because of my reaction to his surprise appearance. 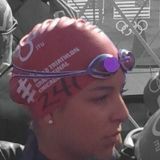 The swim began as a time trail start (athletes line up by bib number and start one by one 5 sec after each other). 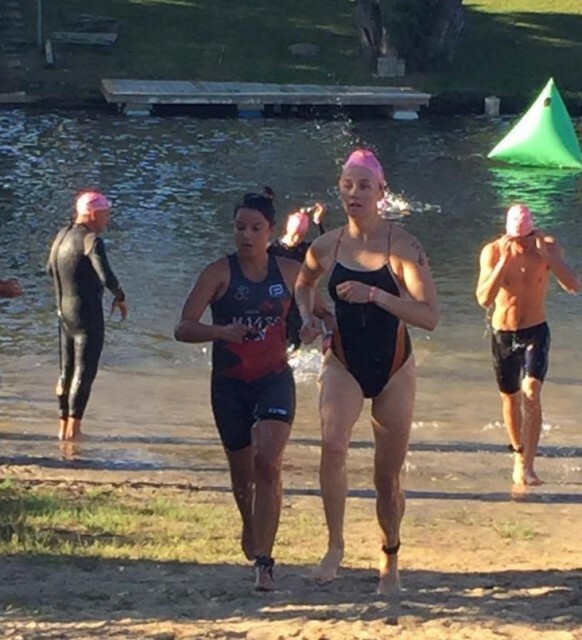 I was happy to get a break from the crazy mass start swims where I have been getting trampled over all summer. The swim felt much calmer from the start allowing me to settle in to a comfortably fast swim pace. In transition I had the great idea of putting on my ambassador jersey with my bib over my tri suit.... I was soaking wet so the jersey rolled up at my shoulders and took me forever to get on. Eventually, I managed to get it on and I was on my way to the bike! The bike course was great and challenging with rolling hills and steep hills! 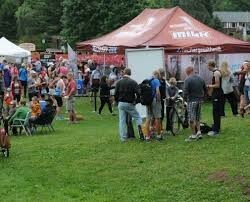 It was different than my last race at the draft legal race for Nationals in Ottawa (See My First Draft Blog Post). The difference I found was that in this non-draft legal race the bike ride felt lonely and felt super slow compared to the draft legal. On the other hand, non-raft legal racing is great because you do not have to worry about what the people inches away from you are doing and you can focus on yourself and know that the race was all you. The run was my favorite part in this race. Coming off the bike my legs felt great and I was excited to complete yet another great Multisport Canada Recharge with Milk Series Race, cross the finish line, and reunite with my awesome cheer team! In the end, I finished 4th in the 20-24 age category! 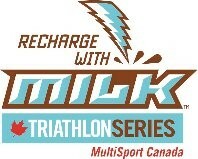 Thank you to Multisport Canada Recharge with Milk Series for a fun event and your support. Also, thanks to the volunteers who were super encouraging and helpful handing out water throughout the race. Last but not least, thank you to my wonderful cheer team I couldn’t have done it without you.